Global Site Tag, more commonly known as gtag.js, is already the default snippet in Google Analytics, whereas analytics.js is now the alternative. However, by no means does this signify that analytics.js is on its way out or that it will soon become defunct. The likelihood is that you will be able to continue using your analytics.js setup for several more years. The question, then, is: Should you consider migrating to gtag.js? There’s actually no need for the majority of users to migrate to gtag.js — and especially while it remains in beta version. If you’ve already set up Google Analytics and AdWords, migrating will just be an unnecessary hassle. This is particularly true if you’re already using Google Tag Manager, which has all the features of gtag.js and then some. In fact, Google recommends using Google Tag Manager over just about any other option. If you’re setting up a new site, it may be worthwhile to look into using gtag.js, especially if you have no knowledge of Google Tag Manager. If, however, you do understand Google Tag Manager (or you’re willing to learn), that will be the better option for you. 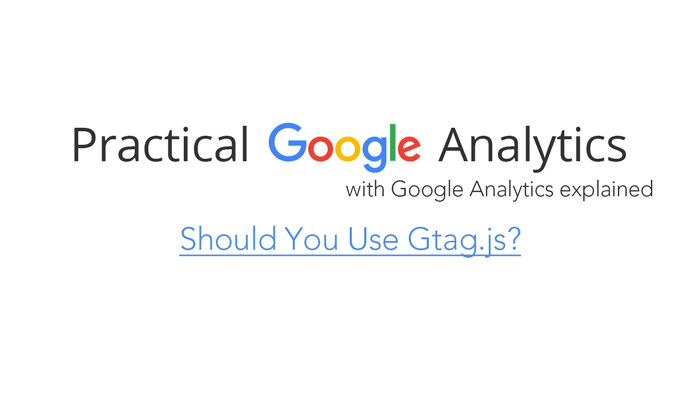 Those with websites set up with on-page code in Classic Analytics should also consider gtag.js. It is going to become increasingly difficult to maintain your website with Classical Analytics, as you’ll have minimal third-party support, you’ll find that tutorials are all for Universal Analytics, and usually the only information you’ll gain for Classical Analytics will now be out of date. In other words, if you’re still using Classical Analytics, it’s time to upgrade anyway. You may want to opt for gtag.js while you’re at it. However, the same applies as above: if you’re able to use Google Tag Manager, this is better. There are already tracking tools out there that support the migration process. However, few have better usability and customizability than Google Tag Manager. If you have a tool in mind that you know will improve your tracking capabilities (such as for e-commerce on a specific CRM), consider gtag.js. Otherwise, just use Google Tag Manager. A final situation in which you may like to use gtag.js is if you’re using a tag management system (TMS) that does not use a tag template for Google Analytics. However, using analytics.js is an equally good option here. As gtag.js is just a different tagging syntax, for most users there is no real difference between migrating and sticking with the current system. You’ll see no changes in function, only implementation. It may be a good idea to look into what gtag.js migration would mean — after all, you will likely need to migrate eventually. Just bear in mind that, as yet, that day is not in sight.